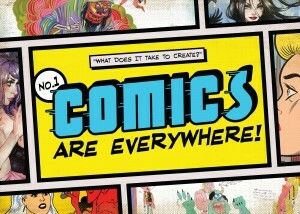 Thank You to Our Backers and Stay Tuned for More News at “Comics Are Everywhere!” : COMICS ARE EVERYWHERE! The first Kickstarter campaign for Comics Are Everywhere! came to a close on August 17. Although we didn’t reach our goal, our journey to make the best documentary about alternative comics and the innovative artists who are the lifeblood of this vibrant medium pushes onward! This is not a failure in our eyes. Rather, we embrace our project’s first crowd-funding effort as an incredible learning experience, and we thank all of you for your support. We are both grateful and humbled that 91 extraordinary backers like yourselves rallied around our cause with heartfelt affection. We couldn’t have come this far without your kindness and generosity of spirit. As with many Kickstarter campaigns, the majority of our backers came from our personal circles of friends and family. We also reached out to strangers who share our love of comics, film and the arts in general. And these strangers responded by joining the ranks of our newfound friends and allies who believe in our cause. Make no mistake – our resolve and enthusiasm are undiminished and remain as strong and focused as ever. Throughout this process, we continue to move forward and Comics Are Everywhere! will persevere and blossom. The film is building momentum and we are living proof that perseverance and hard work will eventually pay off with quality, creative work that we can be proud of. We will complete this cinematic labor of love by any means necessary. Down the road, you will hear from us again. We will launch another crowd-funding effort once we get closer to the film’s post-production phase. We’re confident that we are creating a unique documentary that promises to both illuminate and celebrate comics as a subject intimately linked to the mysterious nature of creativity in contemporary life. We are proud to say that our project’s tenacious spirit of adventure and our willingness to leap into the unknown mirrors the fearless creativity and risk-taking visions of our subjects. In the coming year, we will gather new footage and dig deeper into why comics remain a resilient and relevant art form in the 21st century. After all, the intent of our campaign was as much about developing a grass-roots community built around our mutual passion for comics as it was about raising funds. Thank you for answering our call to become backers who were willing to show your support with an abundance of positive thoughts, good will and optimism! Stay tuned because our adventure in indie filmmaking continues!